Opportunities to escape the concrete jungle and get a taste of small-farm life abound in the Minnesota summertime. Whether you’d like to do a basic farm tour, enjoy dinner served up right on the pastures where the food was raised, or even help out with farm chores for a day as part of a “crop mob,” you can find an option that gets your city-slicker self out in the fields for at least a few hours. One fine Friday a couple of weeks ago, about 40 of us curious folk took advantage of one such opportunity to join a monthly tour run by Thousand Hills Cattle Company, a beef producer based in Cannon Falls specializing in 100 percent grass-fed, primarily local, meat. And we got more than a stroll through the pastures, which is what makes this tour stand out among others that I’ve taken. 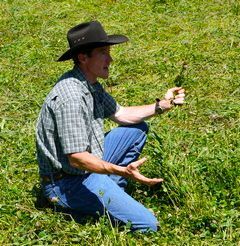 In addition to guiding us through his ranch, Todd Churchill, the founder of Thousand Hills, gave mini-lessons in nutrition (human and cattle) and land management to explain the purported health and sustainability benefits of pasture-based farming. Plus, we ate a delicious free lunch featuring Thousand Hills burgers and beef franks. Finally, we went where his cattle go after a lifetime of grazing has come to a conclusion -- Lorentz Meats, the slaughter and processing plant that Thousand Hills uses. Todd ChurchillUsually farm tours stick to the fun and photogenic parts of farming: the rolling hills, the pumpkin patch, maybe even the baby-animal barn, if you’re lucky. This tour refused to allow you to ignore the grimmer side of raising livestock for food, and there’s a lot to be said for that. As we all piled into the Lorentz Meats lunchroom, which ironically houses the viewing deck that overlooks the slaughterhouse’s kill floor, people immediately gravitated to the window to see the action. A couple of parents brought their young children along, clearly intending for them to learn the whole story of where their food comes from. The mood was sober and respectful, but stopped short of being either sad or sentimental. In fact, most of the tour-goers were impressed with Lorentz’s dedication to both humane animal treatment and clean, safe food, and told our tour leader so as they left the room. That’s not to say that no one was shaken at the sight of cows being led systematically to their deaths. One sometime-vegetarian I met was visibly disturbed, but said she felt better after seeing the cow herd at Churchill’s ranch (which we visited after Lorentz Meats). The cows milling in the shade of huge old trees looked, she said, like they had a good life. Another visitor concurred, saying “They seem like happy cows to me!” And indeed, they were calm and collected as could be, even with a crowd of people gaping at them. The lush grass clearly trumped our presence as an object of interest. 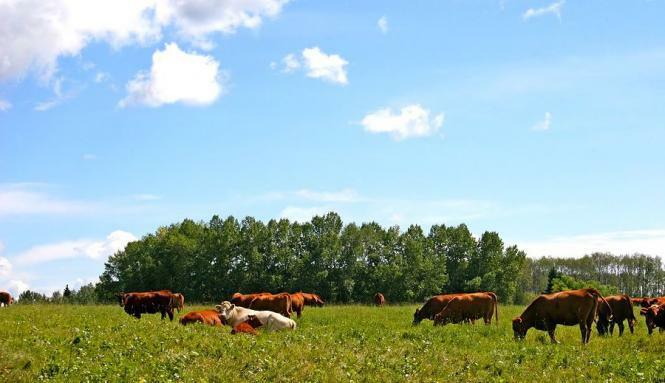 If you are interested in exploring the lives of grass-fed cattle from beginning to end, Thousand Hills Cattle is offering two more tours this summer, on August 9 and September 10. Visit its open house page for details. Angelique Chao is a freelance writer in Minneapolis who spends her time noodling about the ethical implications of what we choose to eat. She's a frequent contributor to Simple, Good and Tasty and is author of a post that continues to attracts comments from meat-eaters and vegetarians alike: Why Animal Lovers Should Eat Meat. She blogs at http://fromanimaltomeat.com.